You are so excited, ready to forge ahead with an exciting new kitchen remodel, and now…suddenly it’s all so overwhelming. We get it! Without a solid understanding of product options, pricing, and kitchen design trends, it’s difficult to know where to begin. That’s why we put together the helpful 5-Step Kitchen Remodeling Guide below. It’s a helpful resource for you first-timers and a refresher course for those who are re-designing their kitchens once again. The first thing you want to do is make a list of everything you Need and Want. Go through and circle the Needs, and number them by priority. Do the same thing for the Wants. 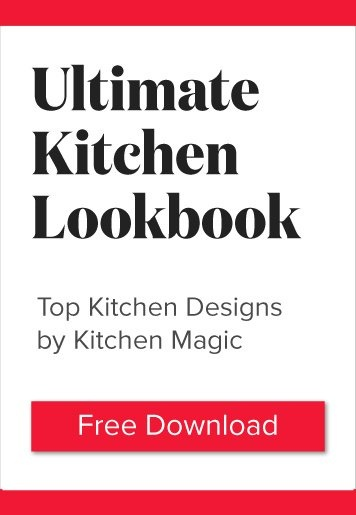 This is a handy tool to bring with you as you begin to discuss your project with an interior designer, the Kitchen Magic Experts, and contractor(s). We can help align your list with your budget, which brings us to Number 2. This is critical. When we say know your budget, we mean know your budget...and stick to it. Always allow 10-15% extra for your Mystery Expenses. You never know what "issues" may turn up in the middle of your remodel. (If you don't need it, you can use it for a weekend getaway to recover from the remodel). Of course, at Kitchen Magic we always honor the price we quote for our part of your kitchen remodeling.With the wide range of fixtures and finishing options these days, you're guaranteed to get a kitchen you love at a price you can afford. The best kitchen designs fall into one of three categories: Modern, Traditional, or Transitional. What's your style? Modern: Clean lines, angles and edges, and an overall cool aesthetic. Think stainless steel, streamlined cabinets, and minimal countertop accoutrements. Traditional: You like a cozy kitchen that reminds everyone of "home". It's hard for you to purchase anything that isn't natural wood, and you appreciate curves as much - or more than - angles. Transitional: You like a little of both. Your gourmet kitchen has top-of-the line stainless steel appliances and a natural stone countertop, but it also provides an warm, inviting ambiance. Your style will lead you to the ideal kitchen cabinet choice, in terms of door style, finish and/or color. Custom Cabinetry: If you are completely gutting your kitchen, ask us about our custom cabinetry. You can work with us to design the cabinets of your dreams. Cabinet Refacing: If you're content with your current cabinet layout but want to update the design, cabinet refacing is the perfect option. Not only is it eco-friendly, refacing can save you thousands of dollars. You can still repurpose cabinet space(s) and/or integrate high-end hinges and closers. Your kitchen countertop selection is critical. Counters reflect your values, kitchen use, and - of course - style. Here are suggestions based on general preferences. Eco-friendly: Quartz and Corian countertops use post-consumer recycled products, low-toxicity synthetic materials, and are ultra-durable. They're also low-maintenance. Luxury: In addition to Quartz and Corian, Granite countertops are still considered a top-shelf countertop finish with countless colors and patterns to choose from. Make sure to seal granite surfaces annually to preserve their natural beauty. Budget: Laminate surfaces have come a long way in the past 15 years. Ask to see samples which closely mimic natural stone and Corian counters. Once you have the above five items in order, your decisions regarding flooring, backsplashes, and other design options will fall easily into place. And as always, you can conveniently schedule an appointment online for a free consultation. We love to help transform our customers' kitchens into magazine-worthy interior designs.